In 1960, the US Navy came up with a four-letter acronym to guide the design and engineering of fighter jets: KISS. It stood for ‘Keep It Simple Stupid’, and was meant as a reminder that simpler systems or models are often more robust than complex ones. Today, this idea has become common advice across a wide variety of fields, from software engineering, to advertising, to program design, to physics. Making models of the way the world works, from conceptual ones to mathematical ones, is the bread and butter of science. Scientists love to draw diagrams representing the world around them with boxes and arrows. “These conceptual frameworks are fundamental to the scientific process, as they allow us to visually represent the states and process of systems, to generate hypotheses, and can act as boundary objects allowing us to more effectively work with collaborators when concepts are difficult to articulate with words” says Christine Lamanna, decision scientist at the World Agroforestry Centre (ICRAF). It is for this intrinsic value that conceptual frameworks have become a building block of research, including that of agriculture and nutrition. For example, Kadiyala et al. (2014)’s influential framework identifying six pathways from agriculture to nutrition outcomes in India has already spurred advances in both research and policy by providing a theoretical background to interrogate empirically (see Carlotti et al. 2016 for discussion). But this framework – like most – only captures part of the system. And many researchers are now trying to expand it, recognizing that many other factors affect agriculture to impact nutrition. Of increasing interest is understanding how environmental change including such things as pollution, pest and disease prevalence, and climate change will affect nutrition, mediated by agriculture. However, each additional element added to a conceptual model increases its complexity and potentially limits its usefulness. “While complex interactions among environment, policy, markets, and people are no doubt driving dynamics and outcomes on farms, being able to capture them in a comprehensible and more importantly - explicable and useful way remains a challenge,” suggests Todd Rosenstock, Environmental Scientist at ICRAF. Phalkey et al. 2015 put together the most recent conceptual model combining climate, agriculture, and nutrition (specifically stunting), building on earlier and simpler frameworks (Tirado et al. 2013). Working with climate scientists, agronomists and nutritionists, we at the IMMANA-funded Surveillance of Climate-smart Agriculture for Nutrition (SCAN) programme have further generalized these frameworks by adding specific drivers and interactions not previously captured (see Figure 1). Figure 1. 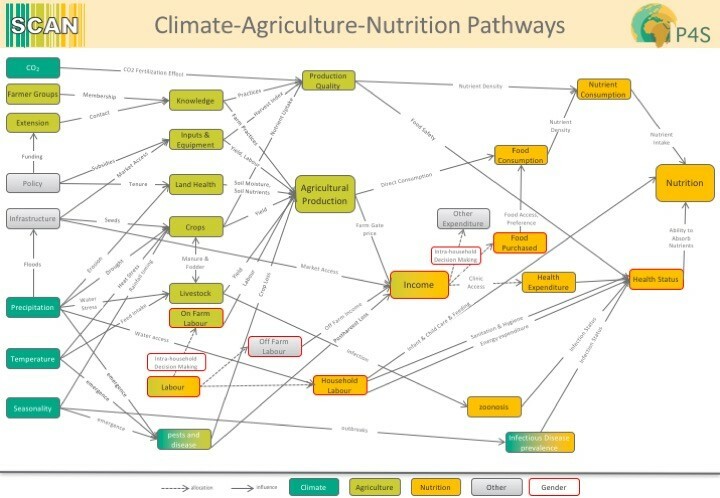 Detailed conceptual and mechanistic model showing plausible linkages among climate, agriculture and nutrition. But the question remains whether illustrating this complexity is useful. Does it inform our understanding, or does it simply justify our inability to create generalizations from the data we see? Based on our experience working up this conceptual framework, the answer is very much “it depends”. For scientists, such a framework clearly highlights testable hypotheses and illustrates where more research may be needed. Such research could potentially improve nutrition outcomes for the millions of people who receive agricultural development aid around the world. But what about policy makers? We just returned from a two-day meeting of the Pan-African Climate-Smart Agriculture Alliance. Hundreds of policy makers on agriculture and the environment in Africa were in the room. The above framework elicited little more than a passing glance. By contrast, straightforward messaging spurred conversation (Figure 2). Figure 2. 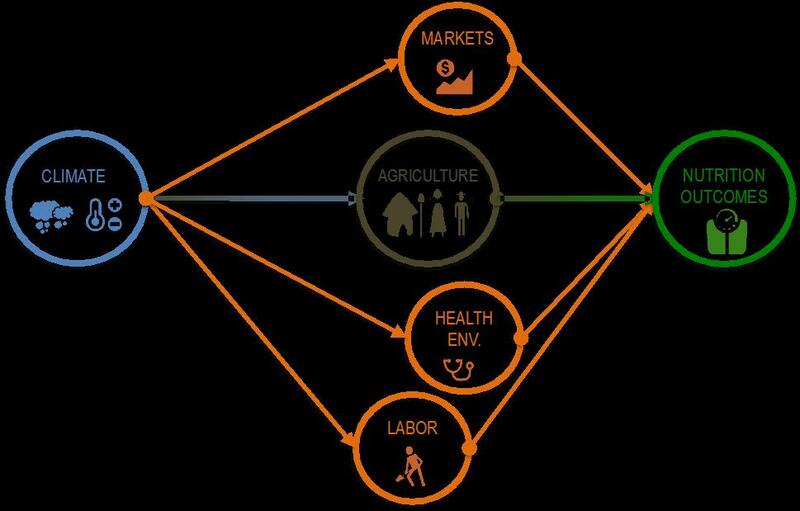 Simplified conceptual diagram of the linkages among climate, agriculture and nutrition including mediating factors (orange). The general wisdom is that when presenting science to the public, or to policy makers, you need to KISS: simplify the message for non-experts in your field. However, when the science is increasingly acknowledging the complexity of the systems policy makers are trying to influence, what then? Do we KISS and deliver small actionable messages that may not tell the whole story? Or do we not KISS and challenge decision makers to think about their systems in more interconnected and nuanced ways? If we want policy makers to demand, digest, and use our science, we need to reconsider how we deliver the message. We are in no way suggesting to ignore complexities or uncertainties. However we must be more specific in our language and our graphics, and compelling in our storytelling. These are not skills that can be developed overnight, nor are they critical for every scientist, but for those that are increasingly wanting to apply science in interdisciplinary and multi-sectoral conversations, they would do well to interpret the signals and know when to and when not to KISS. The SCAN team is currently in the field in Kenya testing whether mobile phones can be used to monitor nutrition outcomes. They hope that this kind of research will help bring more data to scientists and policy makers and help facilitate greater understanding of how agriculture effects nutrition in Africa.